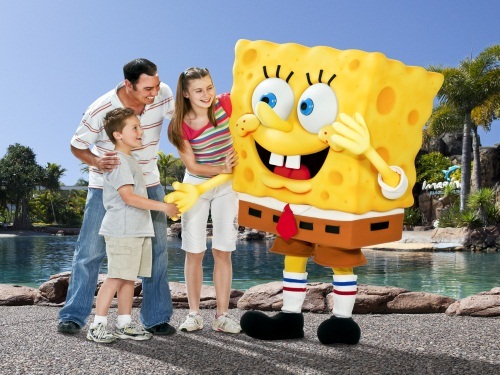 Theme Park Press Releases: The World’s First SpongeBob SquarePants Parade Comes to Sea World! The World’s First SpongeBob SquarePants Parade Comes to Sea World! Sea World has announced details of the world’s first SpongeBob SquarePants parade, which will launch at the park this Christmas. The multimillion dollar parade will be a large-scale attraction for fans of all ages and has been developed exclusively for Sea World by the creative team behind SpongeBob SquarePants. Sea World Director of Operations Michael Croaker said that the parade will feature key characters and design elements from Nickelodeon’s hugely popular animated series. “This will be a huge hit with families as the undersea world of Bikini Bottom comes to life in a spectacular show like nothing else ever seen at Sea World. Sea World will also launch a new live stage show, Dora’s Best Friends Adventure featuring Nick Jr.’s Dora the Explorer in a musical show, which is sure to delight Sea World’s guests. With a host of exciting new attractions and shows planned for 2011 including a new rollercoaster at Warner Bros. Movie World, the VIP Pass is the best way to experience amazing theme park fun while getting great value family entertainment.